I don’t understand what it is, and how it works. And I can’t see the link between what’s happening in my CRM and all of the cash I’m paying these agencies. Can you have a look and tell me what you think? So, there was my brief. I needed to help him see a) if it was working for him, and b) how it all worked. He deeply distrusted digital– and I began to understand why almost immediately. As I lifted the lid on their digital marketing machine, I was shocked. Around $300,000 USD had been spent on Google AdWords over the previous few years. Yet, no one in the company could confidently prove whether any new business was a direct result of that spend. They had been pouring money into a black hole for over five years. This company was under financial pressure and so much money had been wasted by agencies that had not implemented proper tracking. Where did this black hole come from? The company had Google Analytics enabled, along with AdWords conversion tracking. But, they were only tracking form conversions and there was nothing implemented for tracking calls. And in their industry, phone calls were the preferred method of communication by customers and prospects. They dealt with complex, expensive products which led to a lot of inbound phone calls. 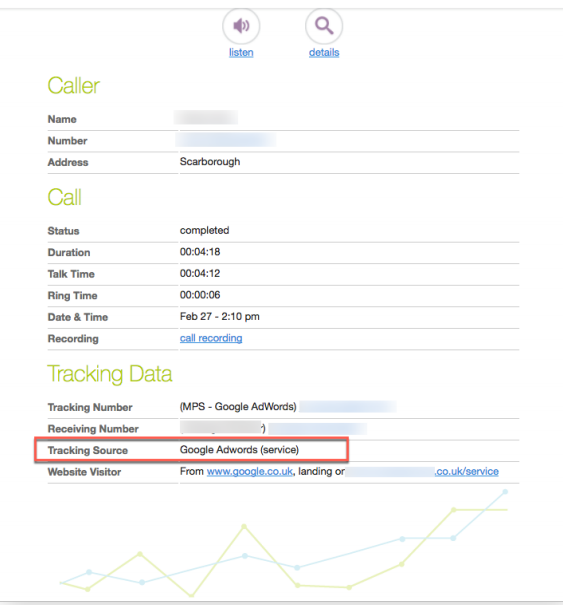 Without call tracking, we had no idea who was calling, or which of their marketing tactics and channels had worked. Sure, you can poll prospects – but they often do not remember where they first (or last) heard about you. The first thing I did was implement CTM across their digital estate allowing them, for the first time, to differentiate between a call that was generated by paid search, organic search, direct traffic or social media. In other words, their campaign visibility had increased exponentially. With four channels of ‘sources’ and no tracking in place, there was a 25% chance that an inbound call came from any of their 4 channels. And with CTM in place, we finally had 100% segmented accuracy for inbound calls from those channels. That’s a 300% increase in visibility. In the span of a month, we helped the client generate as many leads as they had collected over the entire previous year. Proper tracking and accurate insights dramatically increased their lead generation volume, and they were off and running. They no longer had to conduct a thorough investigation to find out where each lead had been generated. It was nicely displayed at the bottom of each new lead email! This didn’t just add visibility, it reduced workload for the client. All of the metadata from calls flowed straight into Salesforce, which updated existing records or added new records. Amazingly easy. Now they could easily calculate the cost per lead in any given channel. This was the first time they had been able to measure ROI in over a decade of spending on digital marketing. We could now compare all marketing tactics, online and offline which enabled them to make informed decisions, and adjust spend as needed. Total spent on AdWords for given period. Total number of leads generated by AdWords. Average Cost per Lead for AdWords. Customer Acquisition Cost for AdWords. This was a simple but extremely powerful position to be in when managing ten or more channels. It allowed them to quickly and easily ‘rebalance’ their portfolio of lead generation assets and channels. It’s such a simple thing, but the fact that CTM comes with great performance reporting baked right into the product was a revelation. With CTM you only see what you need to see. This is surprisingly uncommon in the world of digital marketing and sales tools. They often overflow with irrelevant (vanity) metrics, yet CTM keeps focused on what matters, ROI-based performance. This feature was a huge time-saver, rather than trying to piece together the data to see what was happening, it was all right there. They identified that their digital channels were creating sales opportunities, but that agents weren’t closing as often as they’d like. With CTM’s call recording feature, each staff member was empowered to listen to their successful and unsuccessful calls and make improvements as needed. It became a great training tool. Without the differentiation of sources, inbound callers could have come from anywhere: conferences, presentations, outbound sales tactics, billboards, flyers, and print ads. Therefore it was easy to blame marketing efforts, when the actual problem was with the handling of leads. Their entire inbound call management strategy changed, thanks to CTM. This eliminated the need to hold frequent formal staff training sessions, as their operators began training themselves after every call. All they had to do was click the ‘Call Recording’ button and within seconds they were listening and taking notes to improve customer experience. With increased visibility on what was/was not working, they could no longer blindly say that digital “didn’t work” for them. They had evidence. They improved and optimized for greater business growth. They embraced digital and begin to build a competitive edge with better technology and processes. Due to the success of this client, and others we’ve implemented, I whole-heartedly recommend that businesses adopt CTM as a critical part of their digital toolkit. CTM was implemented as part of a larger digital strategy via Compound, a digital strategy consultancy firm. We help businesses to unlock simple pathways to powerful growth through actionable digital strategy covering five dimensions: Design, Process, Analytics, Content, Technology.